Skin-like health monitoring systems, epidermal sensors for robotic knees, and more are in development, according to the flexible hybrid electronics manufacturing organization. 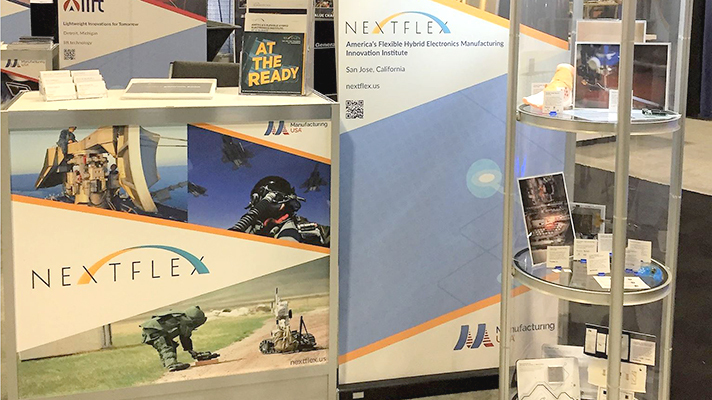 San Jose, California-based NextFlex announced that it is investing $12 million to take on seven initiatives, three of which are healthcare-specific, as part of its Project Call 3.0 to fuel development of flexible hybrid electronics projects. NextFlex described FHE as “an intersection of printed circuitry, passive devices and sensors, and thin, flexible silicon chips.” As such, the resulting technologies enable digital health tools such as sensors, wearables and monitoring devices. While it did not publicly disclose how much money it awarded to each of the seven winning organizations, NextFlex said that on the healthcare side it funded projects by GE working the University of Binghamton, Epicore Biosystems and Lockheed Martin in conjunction with Georgia Tech. The GE and Binghamton-led project is working to apply disposable, clinical-grade vital sign monitoring devices built to increase patient safety and shorten hospital stays. NextFlex also funded Epicore Biosystems work to create thin, flexible systems for disposable, “skin-like” monitoring that can ultimately be used for healthcare as well as athletic performance purposes. Lockheed Martin and Georgia Tech, for their part, earned investment to drive collaborative work creating epidermal sensors for robotic exoskeleton knee control that could enable injury management and rehabilitation for soldiers and industrial workers, the organization said. Lockheed Martin, Boeing and Microconnex also earned funding for FHE projects that are not specifically targeted at healthcare use cases. NextFlex added that it will be releasing Project Call 4.0 in August 2018.